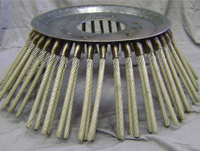 Constructed completely of half inch PVC coated galvanized cable rope brushes. 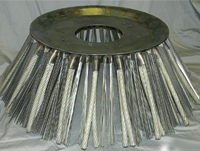 Broom is constructed equally of half inch PVC coated galvanized cable rope brushes and flat wire brushes. 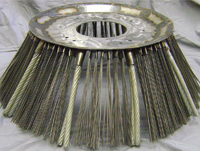 Broom is constructed of (10) half inch PVC coated galvanized cable rope brushes and (40) flat wire brushes. 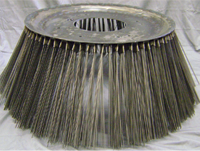 Broom is constructed completely of flat wire brushes. We CAN also develop a street sweeping broom for your machine! Contact us today at 262-886-6918!